Efficient 1/3 HP Induction Motor. Optimum speed of 5200 RPM for peak efficiency. Stainless steel blade, basket and cover. MSRP $279 Based on the Manufacturer's Suggested Retail Price, this juicer is more expensive than average and is priced in the top 24% of juicers. 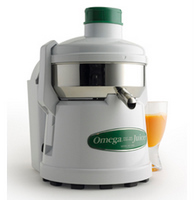 Star Rating 4.1 User reviews, ratings, and feedback indicates that this juicer is rated about average by 43 users when compared to other juicers.